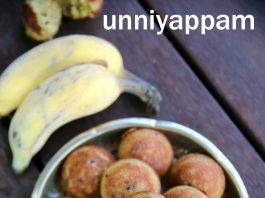 unniyappam recipe | unniappam recipe | neyyappam or unni appam | banana appam with detailed photo and video recipe. a classic south indian or kerala cuisine sweet snack, made from rice, jaggery and banana. it is generally made in temples as offerings, but these days it is also made for festival celebrations feast like onam. 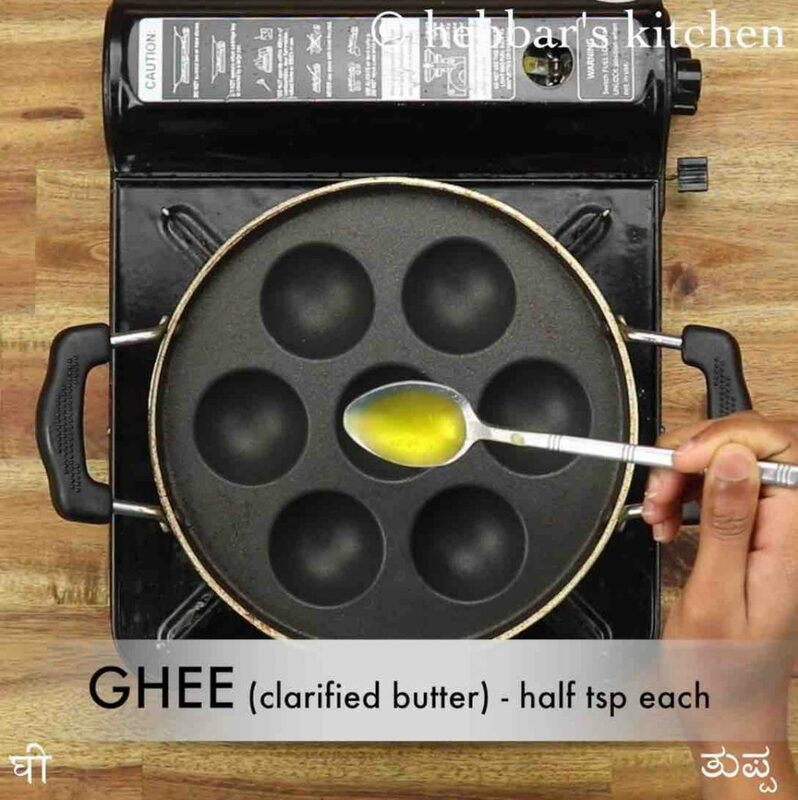 traditionally the snack is deep fried in ghee, but in this post, i have used appe pan. 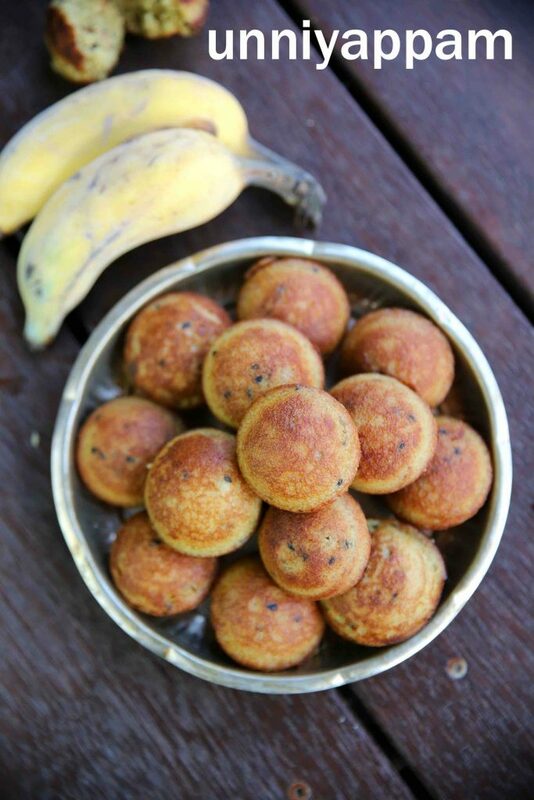 unniyappam recipe | unniappam recipe | neyyappam or unni appam | banana appam with step by step photo and video recipe. 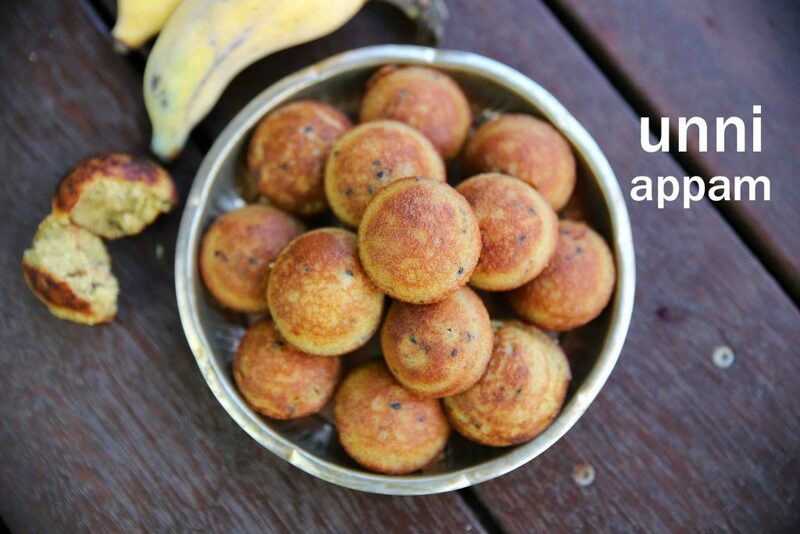 in malayalam language, appam means rice based cake and unni means small or little. it is mainly offered to lord ganapati in many kerala temples and is considered one of the favourite snacks for lord ganesha. particularly, the unniyappam from the kottarakkara ganapathy temple is widely known. sweet appam recipes are always my favourite and i have shared quite a few recipes in my blog. but i have been receiving a lot authentic kerala cuisine recipes, especially for the onam celebrations. 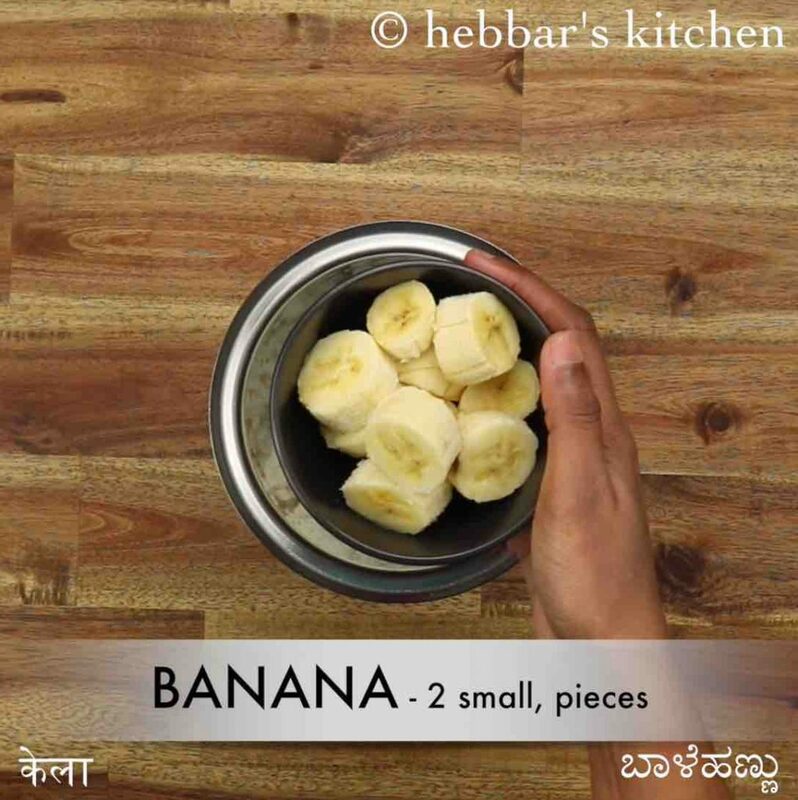 hence i thought of sharing this simple and classic dessert recipe made with basic ingredients like rice, banana, jaggery and coconut chunks. 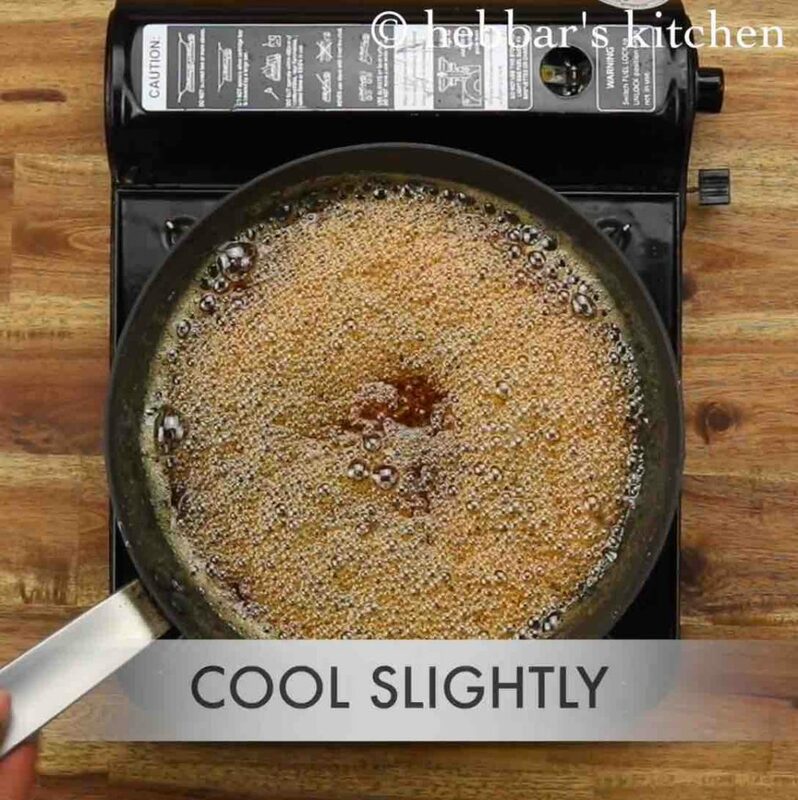 the best part of this recipe is it is made in an appe pan as an alternative to deep frying. hence making this recipe as less unhealthy, and yet deriving the same taste and flavour as compared to deep frying in ghee. having said that, you are more than welcome to deep fry it in ghee or oil or combination of both for an authentic taste. 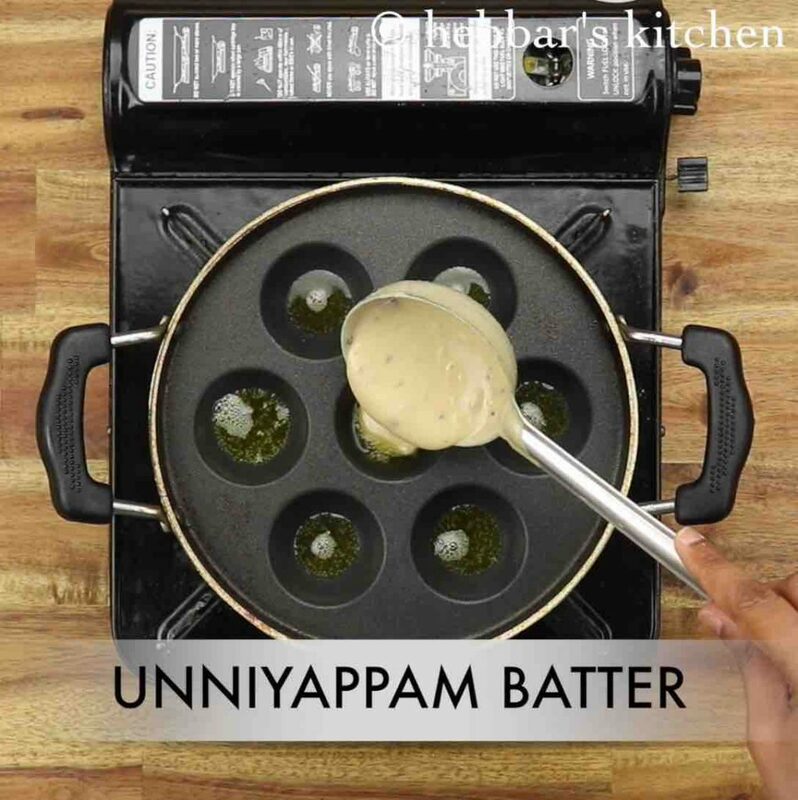 furthermore, some easy and important tips while preparing unniyappam recipe or neyyappam recipe. firstly, in this recipe, i have used chopped dry coconut as i did not have access to fresh coconut. i would heavily recommend using fresh coconut if you have access to it. secondly, i would recommend using overripe small banana or burro bananas or baby banana for this recipe. avoid using plantains or cavendish banana, as it would not infuse less flavour as compared to the previously listed banana’s. lastly, the appam can be stored for 2-3 days in a room temperature and perhaps for 7-8 days if refrigerated. 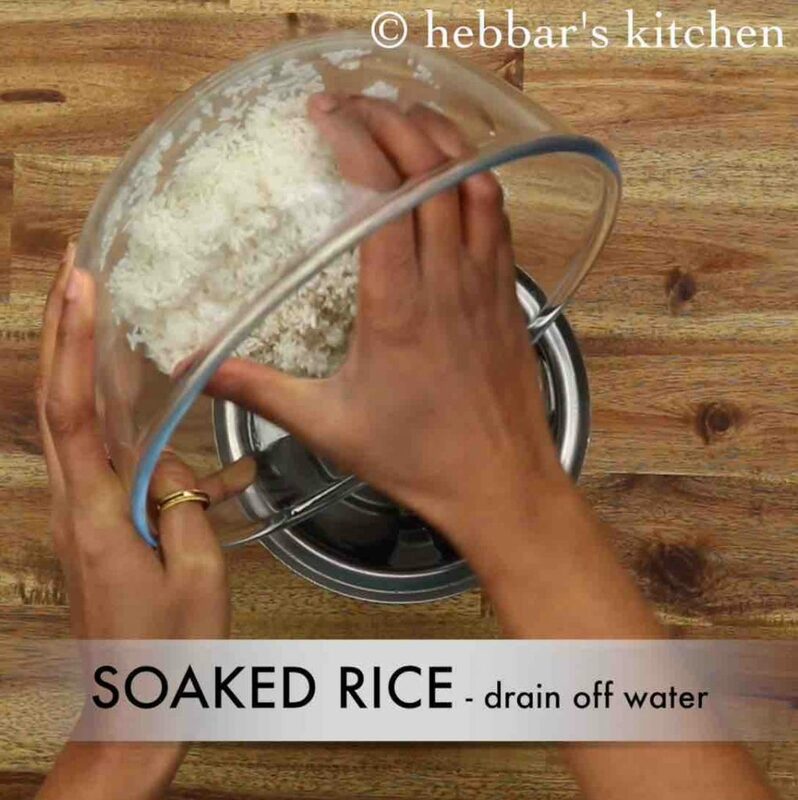 firstly, soak 1 cup rice for 4 hours. add 2 small banana and 3 pods cardamom. 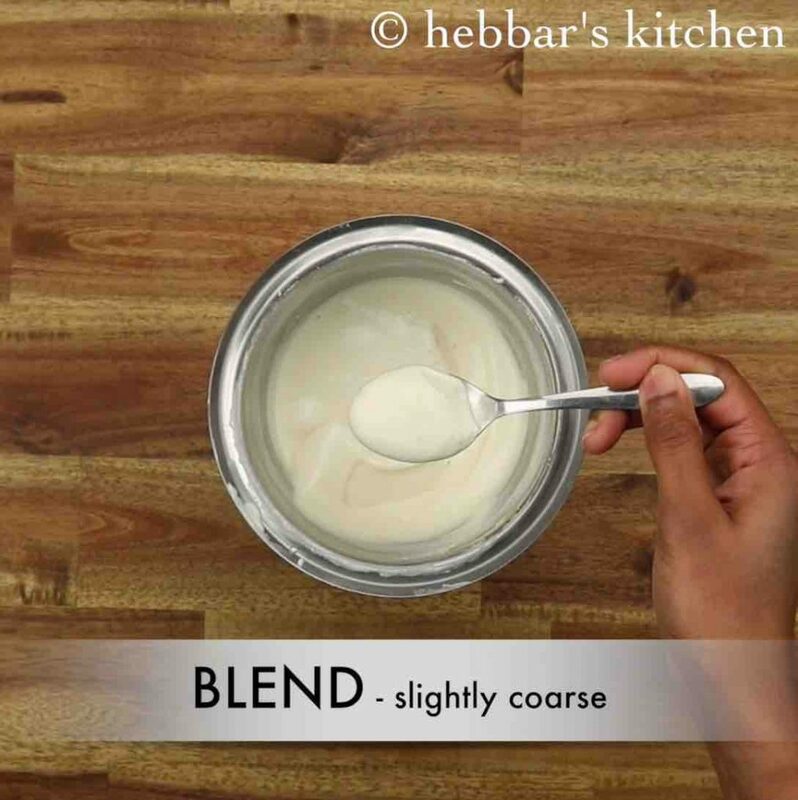 blend to slightly coarse paste without adding any water. now in a tawa take ¾ cup jagger and 2 tbsp water. keeping the flame on medium, stir and dissolve jaggery. 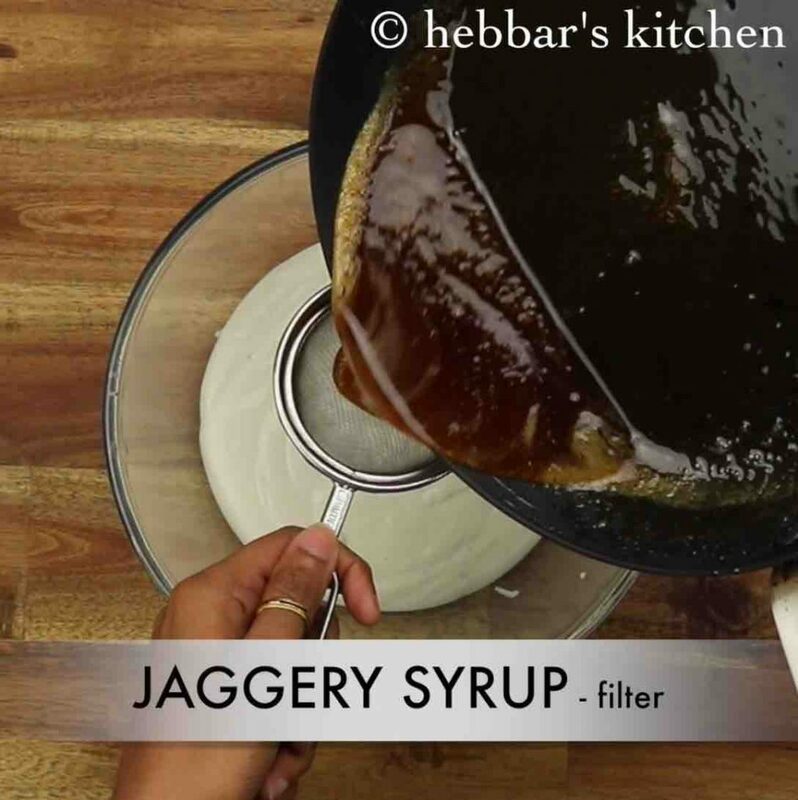 boil to a thick consistency, further cool the jaggery syrup slightly. 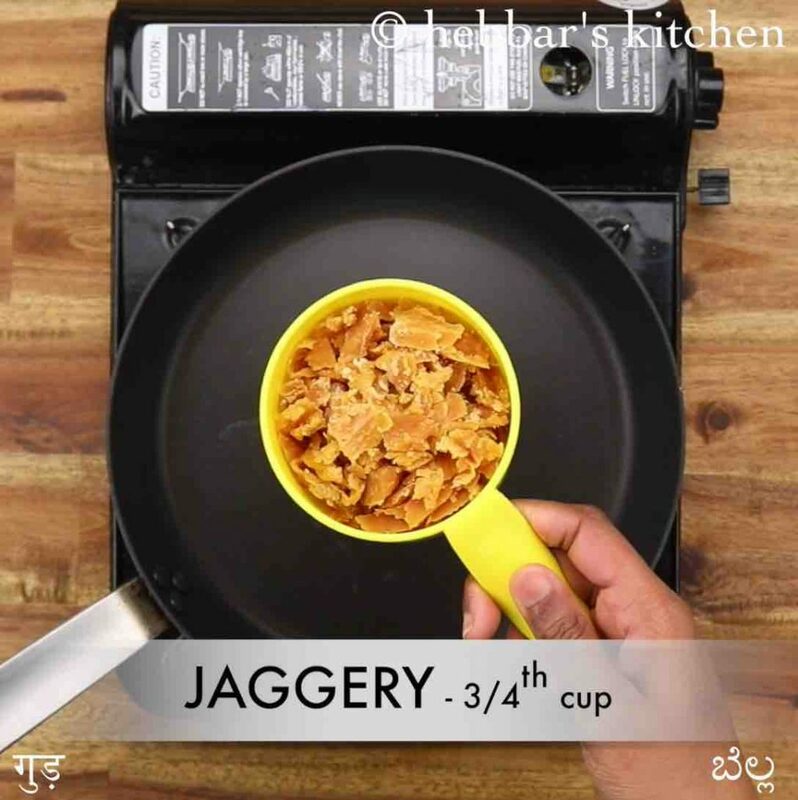 filter the jaggery syrup and pour over rice batter. 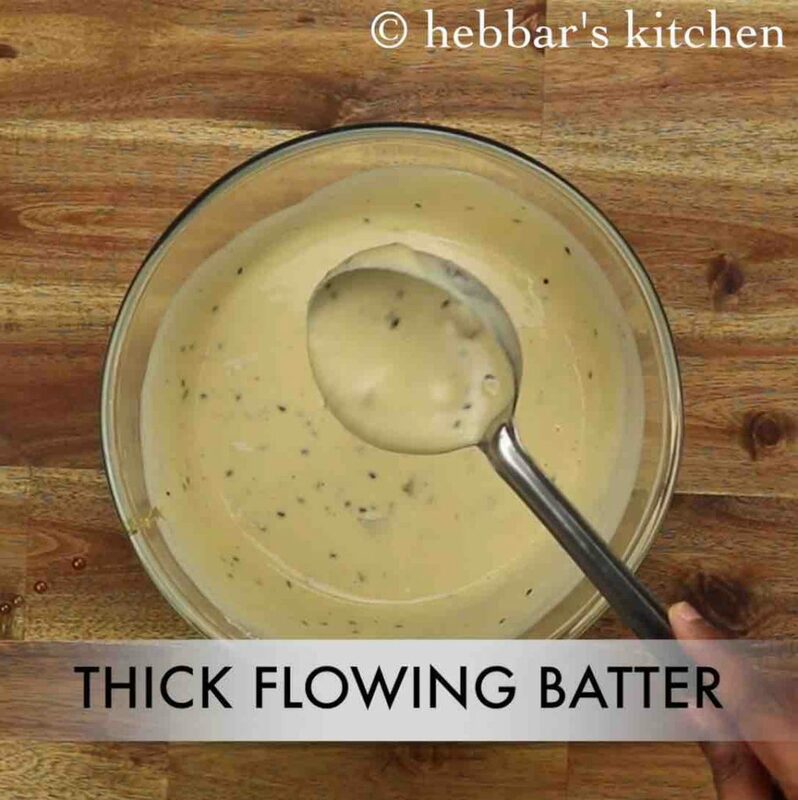 mix well, make sure to get thick dosa batter consistency. further in a small kadai heat 1 tbsp ghee and roast 2 tbsp coconut pieces. 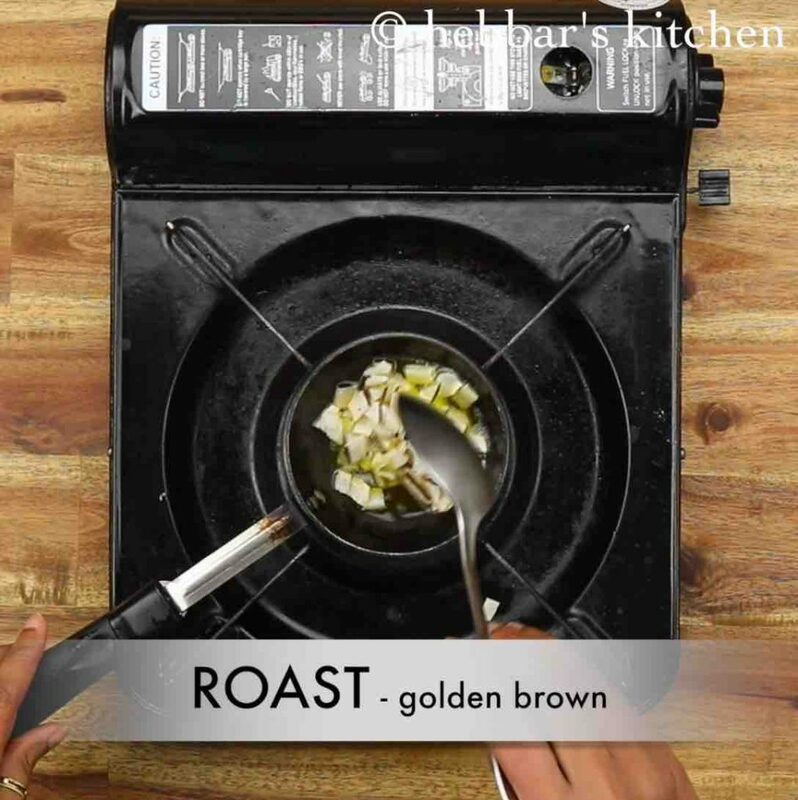 roast to a golden brown without burning coconut. 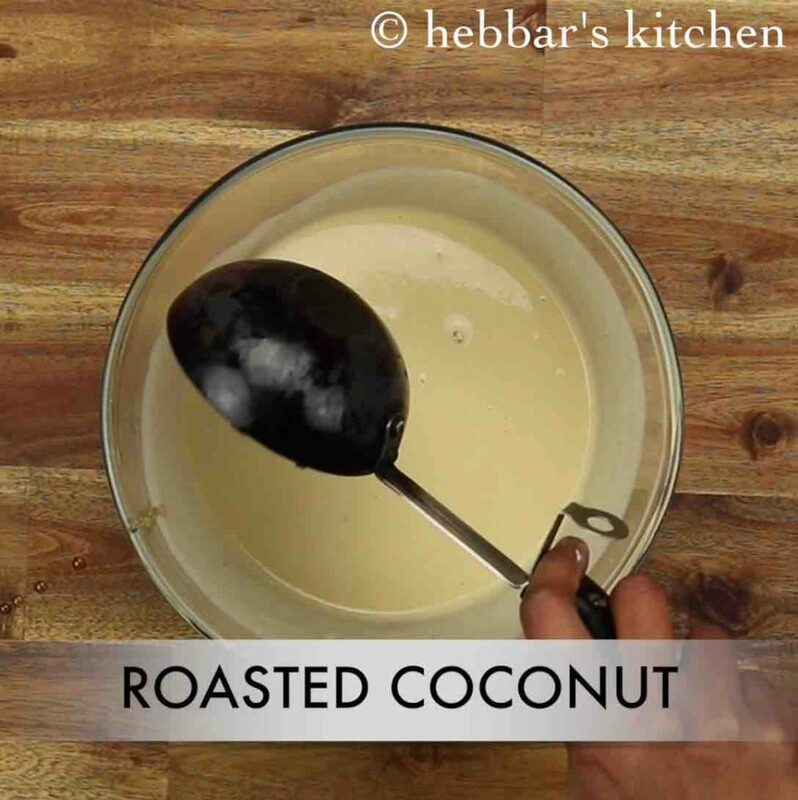 pour the fried coconut along with ghee over batter. 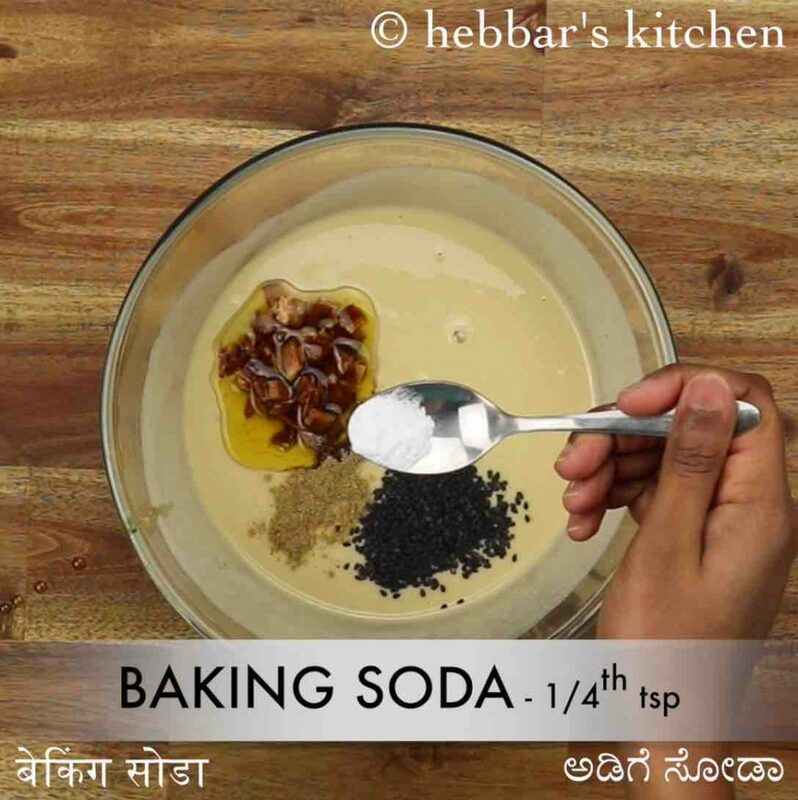 also add ¼ tsp dry ginger powder, 1 tsp black sesame seeds, ¼ tsp baking soda and pinch salt. mix well making sure to attain thick dosa batter consistency. heat appe pan and pour half tsp of ghee in each mould of appe pan. pour the batter into each appe mould. 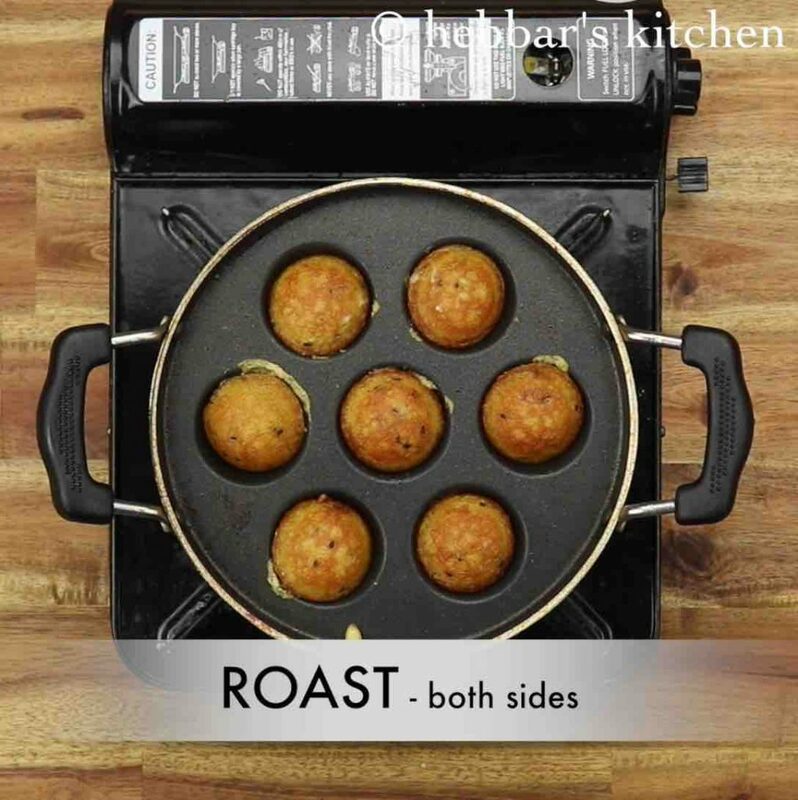 roast to golden brown on both sides or cook until the toothpick inserted comes out clean. finally, enjoy unniyappam / neyyappam hot topped with ghee if required. 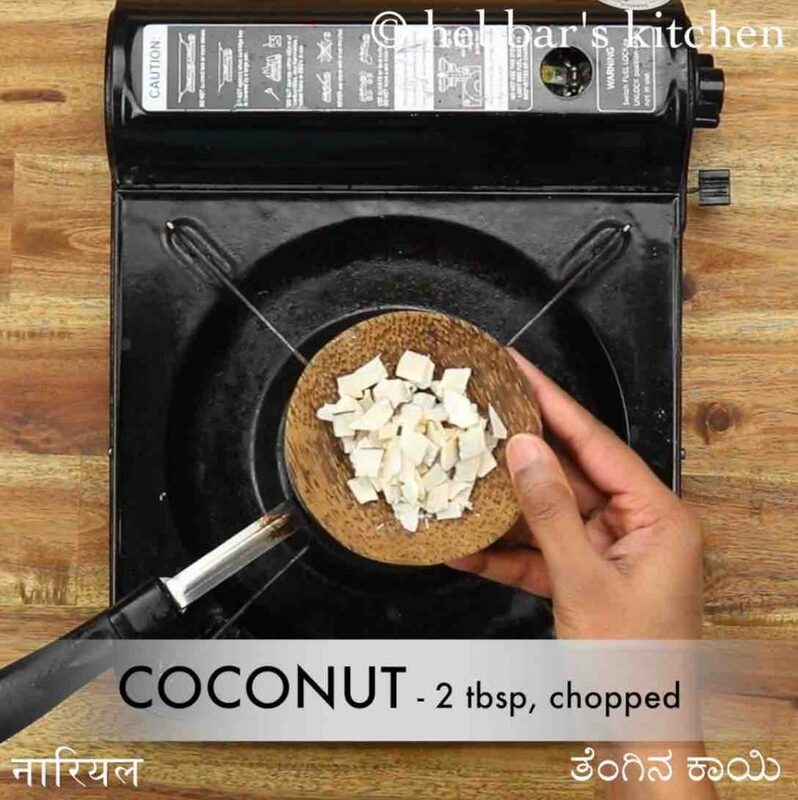 further in a small kadai heat 1 tbsp ghee and roast 2 tbsp coconut pieces. use fresh coconut, however, i did not have access to fresh coconut so used dry coconut pieces. 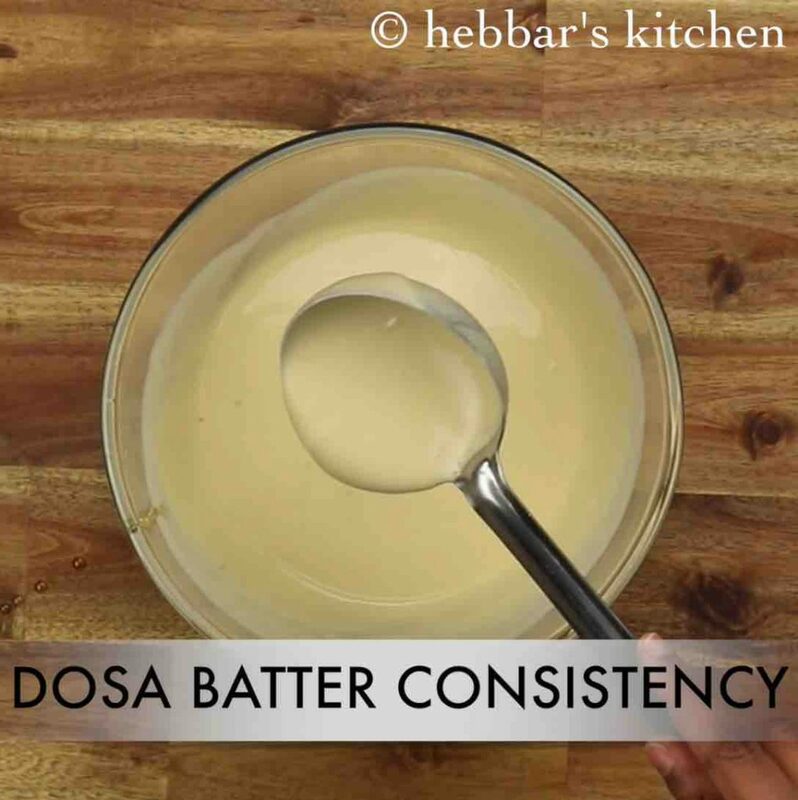 mix well making sure to attain thick dosa batter consistency. else add a tbsp of rice flour, if the batter is watery. 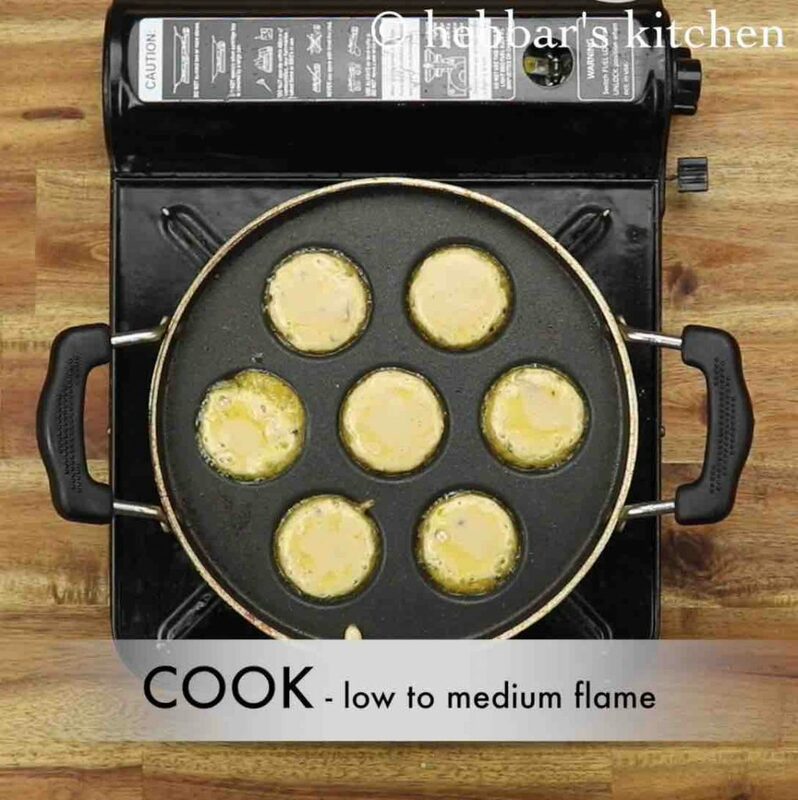 keeping the flame on low to medium cook for 1-2 minutes. 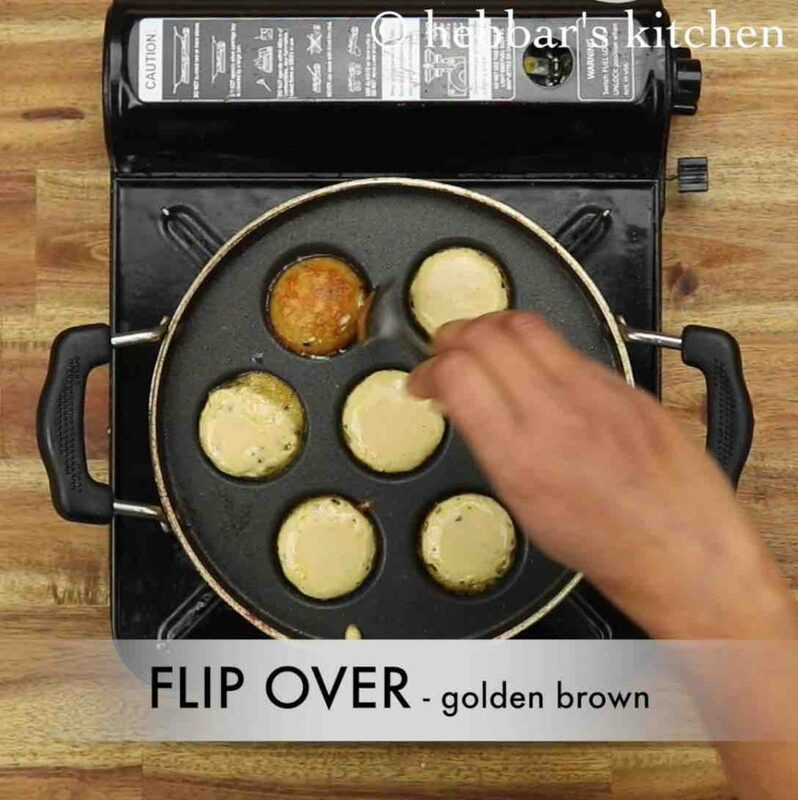 flip over once the bottom turns golden brown. again continue to cook until the toothpick inserted comes out clean. firstly, adding the banana to the batter will enhance the flavour. also, use short grain rice sona masuri rice to prepare neyyappam batter. 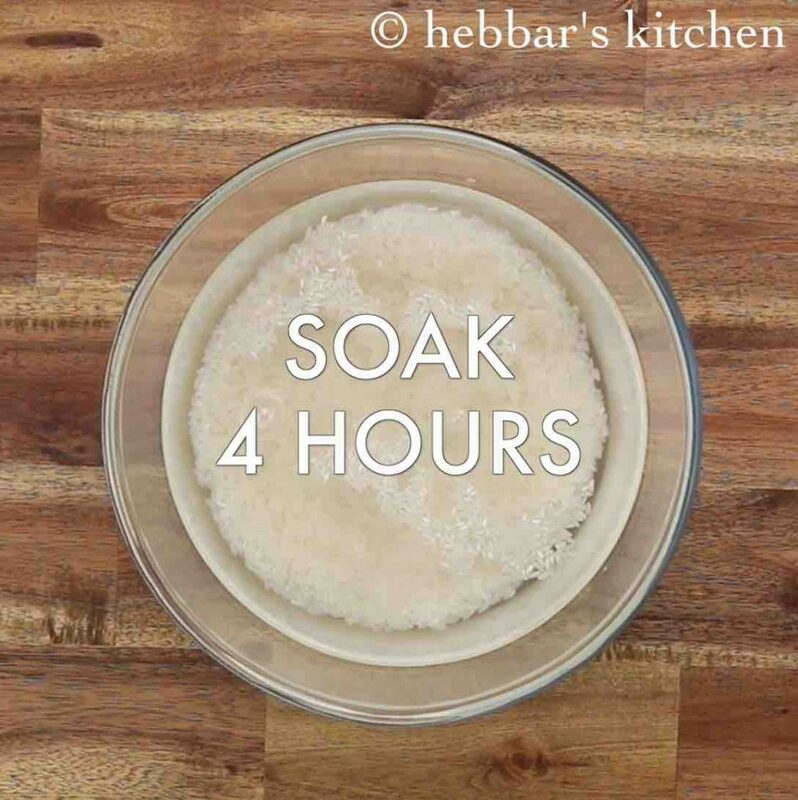 additionally, baking soda can be skipped by fermenting batter overnight. finally, unniyappam / neyyappam recipe tastes great when prepared with fresh homemade ghee.